Leeds United chairman Massimo Cellino will no longer attend the team's games because of calls for him to leave. 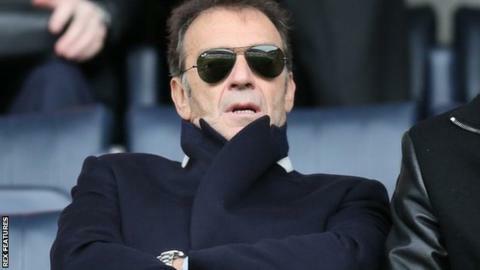 Cellino, who is appealing against a second Football League ban for failing its owners' and directors' test, has agreed in principle to sell the club to supporters' group Leeds Fans United. He told the club website: "It pains me to make this decision. "But what I was subjected to at the Blackburn game left me feeling I had no other option but to take a step away." Leeds lost 2-0 to Blackburn on Thursday to leave them without a win at Elland Road since March. The following day Cellino, who took over the Championship club in April 2014, announced that he was willing to sell his majority stake to supporters. The Italian added: "After the time, effort and emotion I have given to the club to try and enable us to move forward, it hurt me a lot to hear the fans singing what they did on Thursday night. "The fans made it clear they believe I am no longer the best person for this job, and for the first time I am starting to think that they may be correct." Leeds, who are 19th in the second tier, host Cardiff City on Tuesday. November 2015: Vows to no longer attend matches.